The City of Antelope, Oregon was incorporated in 1901. Antelope is located on Highway 218 in south Wasco County, Oregon. 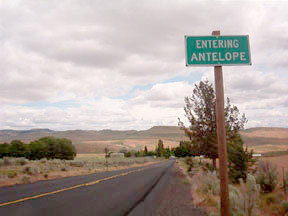 The population of Antelope was listed in the 2010 census at 46. Today the city is experiencing the image of a retirement-oriented community. There are a number of homes and a church in Antelope that are over one hundred years old and beautiful old poplars line the front yards. The amount of land area in Antelope is 1.309 sq. kilometers. The distance to the Oregon state capital is 122 miles. (as the crow flies). Antelope is positioned 44.91 degrees north of the equator and 120.72 degrees west of the prime meridian. The elevation is 2,685 feet. Antelope Valley was probably named in 1862 by members of the party of Joseph Henry Shearer, while packing supplies into the John Day mines. See Bancroft’s History of Oregon, v. 1, p. 787. There were many antelope in central Oregon in pioneer days, hence the name. Antelope post office was established Aug. 7, 1871, and Howard Maupin was the first postmaster, the office taking its name from the valley. The 1862 Shearer party also named Muddy Creek, Cherry Creek, Burnt Ranch and laid the foundation for Bakeoven, all in Oregon. After World War II, the community languished until the 1980s when followers of Bhagwan Shree Rajneesh, who had started the city of Rajneeshpuram on the site of the old Muddy Ranch, came to dominate the town. On Sept. 18, 1984, by a vote of 57 to 22, the charter was amended to change the name from Antelope to Rajneesh. This received considerable publicity throughout the state for feelings about the Bhagwan and his followers were sharply divided. The Bhagwan’s problems came to a head in the fall of 1985 when Anand Sheela, his personal secretary and spokeswoman, decamped to Europe, reportedly with a substantial sum of the sect’s money. A short time later the Bhagwan was indicted on federal immigration charges. After an abortive attempt at flight, he pleaded guilty and returned to India. Meanwhile, on Nov. 6, 1985, the remaining residents, both original and Rajneeshee, voted 34 to 0 to restore the original name. 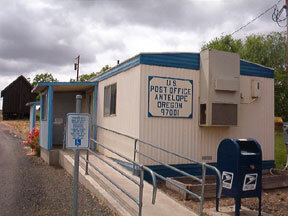 The Post Office Department, relying on the efficiency of Zip Code, 97001, never changed the name from Antelope. Rajneeshpuram was the city and commune developed by Bhagwan Shree Rajneesh in the 1980s on the former Big Muddy Ranch. The Bhagwan, as he was popularly known, was born Mohan Chandra Rajneesh on Dec. 11, 1931, in Kuchwada, India. After a career of study and teaching, he founded a cult in India and in 1981 moved, with a number of followers to Montclair, New Jersey. The facilities were not to his liking so later that year he purchased the 64,000 acre Big Muddy Ranch near the John Day river for $5,750,000. His followers immediately began constructing a large commune which in 1982 was incorporated as Rajneeshpuram. Friction developed at once between the red-clad disciples and Wasco County residents. In 1983, Oregon Attorney General David Frohnmeyer filed suit to invalidate the city. Meanwhile, the commune had grown to over 4000 people and expanded to take over the old community of Antelope which they renamed Rajneesh. In 1984, members of the commune introduced Salmonella organisms into salad bars at restaurants in The Dalles and 750 people were taken sick. In October of that year, busloads of homeless people were brought to the commune from various parts of the United States and registered to vote, apparently in an attempt to take over the county government. This was thwarted and subsequent investigation brought matters to a head in 1985. On Sept. 13, 1985, Anand Sheela, the Bhagwan’s general factotum, resigned and fled to Germany where she was later arrested on a variety of charges ranging from theft to attempted murder. The Bhagwan was being pursued by the U.S. Immigration authorities and on Oct. 27, 1985, he attempted flight but was intercepted at Charlotte, North Carolina on his way to Bermuda. In due course he was deported to India where he settled on his original commune at Pune. He died in Pune, India on Jan. 19, 1990. In 1988, the Connecticut General Life Insurance Company, the mortgage holder, filed to repossess the ranch property and title passed to them in 1989. For much information on this bizarre bit of Oregon history, see an Oregonian series of articles in July 1985 and the Oregonian, Jan. 20, 1990, pp. A1, 16 and 17. Antelope was incorporated in 1896 with John Hollinghead serving as first mayor. In 1897 the Community Church, as it is now known, was built. By 1898, with a population of 170, Antelope enjoyed three livery stables, one blacksmith shop, three mercantile stores, four hotels, one meat market, seven saloons, a church, drug store, barber shop, bowling alley, funeral parlor, post office, city hall, jail, and a community center called “Tammany Hall”. the city, on the old trail to the John Day country, offered a gay social life complete with formal dances, gaslights and boardwalks. Antelope became a center for cattlemen and, later, sheep men, expanding and enjoying considerable prosperity. The years 1870 thru 1910 were known as the era of the big sheep ranches, with sheepherders being imported from Spain, Australia and Scotland. In 1881, the town relocated two miles south of the original stage and wagon stop, when the stage route changed. The community experienced a boom in 1892, and a new school was built and a newspaper began publication. Subsequent years of significance affecting Antelope including the Pelton Dam Project in 1938, and the coming of electricity in 1939. An end to isolation came in 1960 when the roads approaching Antelope were surfaced.